Cullen Resources Limited (Cullen) – an Australia-focused minerals explorer with drill ready targets for: gold and nickel sulphides at its key Mt Eureka Project in the North Eastern Goldfields of W.A. ; and volcanic-hosted massive sulphides at its Wongan Hills Project in the wheatbelt of W.A. The company is also active in project generation in Western Australia and Finland. 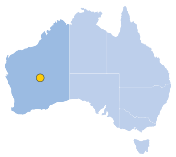 Cullen has two iron ore royalties in the West Pilbara Region of W.A. – one with AMCI-POSCO/Baosteel-Aurizon in the West Pilbara Iron Ore Project and one with Fortescue in the Wyloo Project. 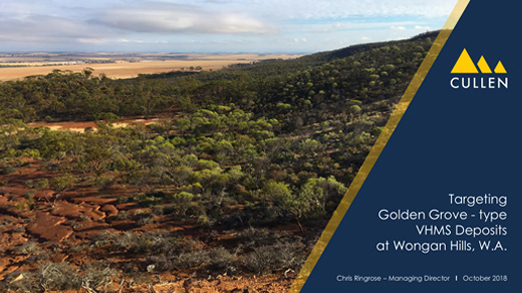 Cullen is exploring an extensive belt of ultramafics in its Mt Eureka Project of the north-east Goldfields of W.A. for nickel sulphide deposits – along strike of known deposits of Rox Resources Limited at Camelwood. Cullen’s Mt Eureka project is also prospective for Archean lode gold deposits with several soil anomalies and aeromagnetic targets ready for drilling. The Wongan Hills Project covers geochemical anomalies in laterite within an Archaean greenstone belt with known Cu-Au mineralisation that, in Cullen’s opinion, resembles the geochemical signature in laterite on the Golden Grove Volcanic-Hosted Massive Sulphide (VHMS) deposit.